When I was searching for idli sambar recipes , I got this one titled as Saravana Bhavan sambar in many blogs & sites. Saravana bhavan is one of the hotels in which I am longing to have my breakfast and dinner. But I have never got a chance . Whenever we go in, it will be crowded and we come out disappointed.Though I have not tasted this sambar, I wanted to try in my kitchen because this recipe is totally new from my usual hotel sambar recipe.No need to make additional powder for sambar.Our usual sambar powder is enough.I have tried the original recipe many times and I felt its less tangy . So I changed the recipe according to our taste buds.Nowadays I am making this sambar regularly for idli & rice upma. It tastes great ! Add this ground paste and the tamarind extract, salt to the cooked dal mixture and allow it to boil well till the raw smell emanates.It will thicken.Add water when necessary. The actual recipe did not use tamarind.As I used Bangalore tomatoes ,I felt its bland. So I added little tamarind extract. If u use Tamil nadu tomato( Naatu thakkali) , tamarind may not be necessary.Make sure the sambar should be mild in tanginess. Tempering at the end gives a nice flavor.If u want u can do this step while sauteing onions. Adding sambar onion gives a nice taste. U can replace with big onion if u don’t have it. If u wish u can use moong dal or a combination of toor & moong dal. 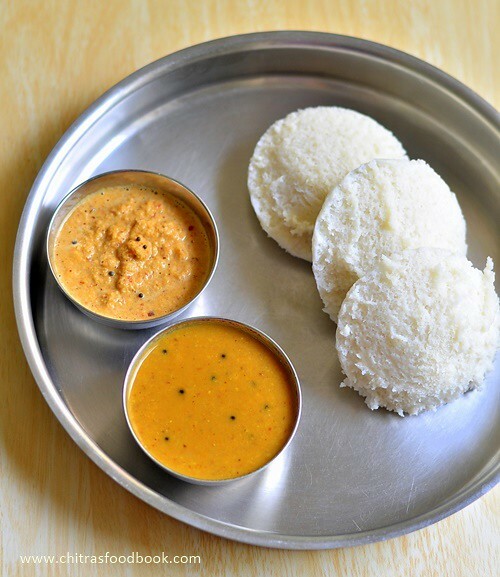 Try this yummy Saravana bhavan style Idli sambar at home and enjoy your breakfast/dinner !! this is one of my fav. breakfast for sure. the sambar looks perfect for a quick meal. Fingerlicking flavourful sambhar, can have two more idlies with this sambhar. 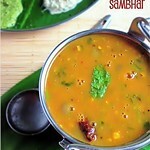 So flavorful n yummy sambar...will try it sometime! yummm... so inviting chutney n podis..
Love the entire table setting with the chutneys and sambar!!! flavorful combo,perfect resatuarant style presentation!! I love saravana bhavan food. But definitely need a lot of patience to wait there and have their food.. Delicious and flavorful sambhar.. Nice presentation.. 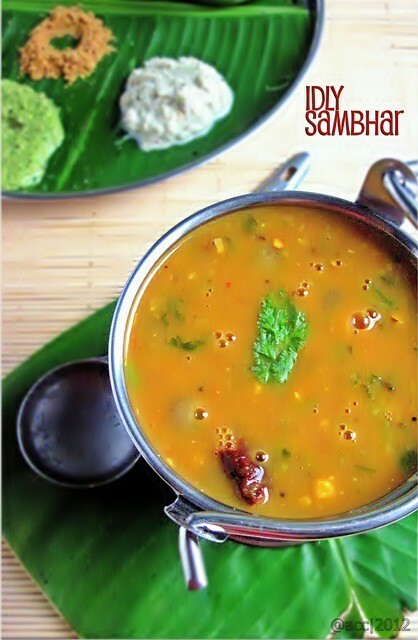 I actually like the bubbles in the sambar picture :)The picture itself says the sambar tastes greattttt! Around 3 cups I feel ( 2 cups for cooking dal and 1 cup to boil with tamarind extract). Please adjust the consistency based on your liking.